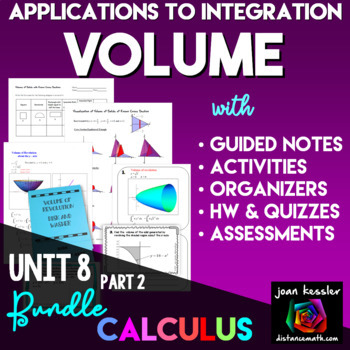 This Calculus Bundle of Volume Activities for AP Calculus AB, AP Calculus BC, and College Calculus 2 is usually found in Unit 6. This is the second of three bundles which comprise this long unit. For this bundle I have included 7 of my most popular activities. Please click on the links below to see individual previews and descriptions. 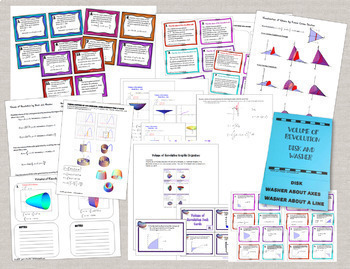 There are scores of Task Cards, HW problems, Study Guides, Notes, Visualizations, Organizers, Fun Notes, and a Foldable Flip Book. I strive to create unique rigorous resources for you and your students, so that each activity is different, challenging, and fun. Note: This bundle does not include Digital Products but I will gladly bundle these resources for you. Email me for details. Thanks for shopping in my store. Custom product requests and Custom Discounted Bundle requests gladly accepted. . If you have any questions or comments please contact me by email me at: teachdydx@distancemath.com.